This article is about the philosopher Anaxagoras. For the mythical Greek King Anaxagoras of Argos, see Anaxagoras (mythology). Anaxagoras (c. 500 – 428 B.C.E.) was a pre-Socratic Greek philosopher. Anaxagoras conceived the origin of the cosmos as the pre-existing, undifferentiated continuum of all material elements of the cosmos. Those elements initially existed in potentiality and were gradually differentiated in the process of development. He explained the process of development as a natural and mechanical one, which is common to the natural philosophy of pre-Socratics. However, unlike other pre-Socratic philosophers, Anaxagoras introduced the idea of Nous, a mind or reason, as the giver of order, purpose, and teleological relationships among things in the cosmos. The Nous, however, remained only as the giver of the initial architecture of the world and did not play any other role. In his dialogue, Plato described Socrates’ excitement toward this innovative insight, and disappointment at its limited role. Both Plato and Aristotle criticized the lack of ethical elements in his concept of Nous. Anaxagoras brought Ionian philosophy to Athens and gave scientific explanations of natural phenomena. His account of the sun not as a god but as a blazing stone evoked a controversy. He was brought to trial on the charge of impiety. Anaxagoras fled to Lampsacus, a Milesian colony, before being sentenced and died there respected and honored. 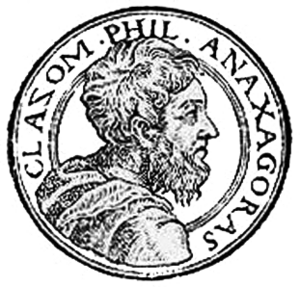 Anaxagoras was born in Clazomenae in Asia Minor. In early manhood (c. 464–462 B.C.E.) he went to Athens, which was rapidly becoming the center of Greek culture, and remained for 30 years. Pericles learned to love and admire him and the poet Euripides derived from him an enthusiasm for science and humanity. Anaxagoras brought philosophy and the spirit of scientific inquiry from Ionia to Athens. His observation of the celestial bodies led him to form new theories of universal order, and brought him into collision with the popular faith. He attempted to give a scientific account of eclipses, meteors, rainbows and the sun, which he described as a mass of blazing metal, larger than the Peloponnesus; the heavenly bodies were masses of stone torn from the earth and ignited by rapid rotation. Anaxagoras was arrested by his friend Pericles' political opponents on a charge of contravening the established religious beliefs, and it required all the eloquence of Pericles to secure his release. Even so he was forced to retire from Athens to Lampsacus in Ionia (434–433 B.C.E. ), where he died about 428 B.C.E. Citizens of Lampsacus were said to have erected an altar to Mind and Truth in his memory, and observed the anniversary of his death for many years afterward. Anaxagoras wrote a book of philosophy, but only fragments of the first part of this have survived through the preservation of Simplicius of Cilicia (sixth century C.E.). Anaxagoras attempted to resolve two conflicting accounts of existence presented by Heraclitus and Parmenides. Heraclitus conceived existence as constant flow or ever-changing process and Parmenides as self-subsisting, changeless One. Empedocles tried to solve the problem by positing four permanent elements (fire, air, water, and earth), where changes and diversity were explained as the combination and dissolution of four permanent elements. These “seeds” are permanent, imperishable, and invariable. They are infinite in number and exist in every part of the cosmos: “In everything there is a portion of everything” (Fragment 11). When one of the “seeds” becomes dominant, a thing manifests its particular characteristics and the homogeneous continuum is differentiated into diverse forms. Anaxagoras presented this idea to answer such questions as: “How can hair come from non-hair, and flesh from non-flesh?”(Fragment 4) The idea of potentiality and actuality existed in an implicit form in Anaxagoras, which was later fully developed by Aristotle. The totality of “seeds” was the material origin of the cosmos. Anaxagoras introduced Nous, mind or reason, which was self-subsisting permanent existence, independent from the material origin of the cosmos; a being that gave order, purpose, and teleological relationships to all beings in the cosmos. Nous was an architect of the cosmos and the first mover of the cosmic motions that caused diversification of the pre-existing homogeneous material origin. The role of Nous, however, was limited to the cosmogonic starting point, and Anaxagoras explained the development of cosmos by natural principles. Anaxagoras proceeded to give some account of the stages in the process from original continuum to present arrangements. The division into cold mist and warm ether first broke the spell of confusion. With increasing cold, the former gave rise to water, earth, and stones. The seeds of life that continued floating in the air were carried down with the rains and produced vegetation. Animals, including man, sprang from the warm and moist clay. If these things be so, then the evidence of the senses must be held in slight esteem. We seem to see things coming into being and passing from it; but reflection tells us that decease and growth only mean a new aggregation (sugkrisis) and disruption (diakrisis). Thus, Anaxagoras distrusted the senses, and gave preference to the conclusions of reflection. He maintained that there must be blackness as well as whiteness in snow; how otherwise could it be turned into dark water? Anaxagoras marks a turning point in the history of philosophy. With him, speculation passes from the colonies of Greece to settle at Athens. By his enunciation of the order that comes from reason, he suggested, though he seems not to have stated explicitly, the theory that nature is the work of design. By the theory of minute constituents of things and his emphasis on mechanical processes in the formation of order, he also paved the way for atomic theory. The conception of thought causing movement in the world passed from him to Aristotle, who postulated a prime mover. Allen, R.E., and David J. Furley, ed. Studies in Presocratic Philosophy, vol. 2. Atlantic Highlands, NJ: Humanities Press, 1975. Mourelatos, Alexander P.D., ed. The Presocratics: a Collection of Critical Essays. Garden City, NJ: Doubleday, 1974. Schofield, Malcolm. An Essay on Anaxagoras. Cambridge: Cambridge University Press, 1980. Anaxagoras of Clazomenae, School of Mathematics and Statistics, University of St Andrews, Scotland. Anaxagoras The Internet Encyclopedia of Philosophy. This page was last modified on 19 March 2016, at 15:34.